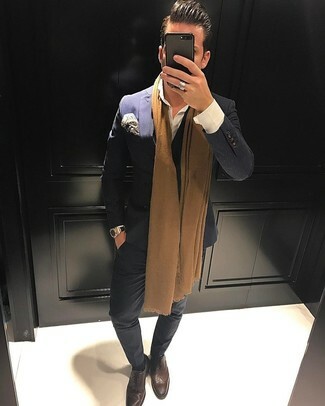 Consider teaming a navy blazer with a MEMPHIS GROUP memphis milano pochette silk pocket square from Nordstrom if you're in search of an outfit idea for when you want to look casually cool. 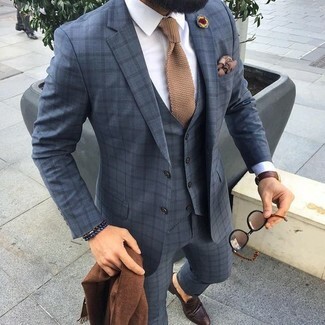 A grey wool double breasted blazer and a brown print pocket square? It's easily a wearable outfit that any guy could work on a day-to-day basis. Dark brown leather double monks will easily dress up even your most comfortable clothes. 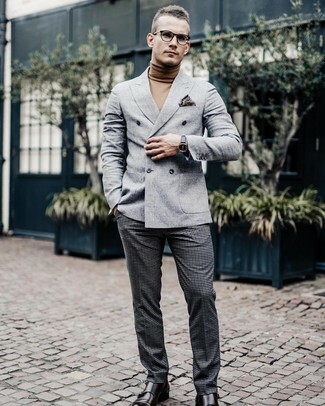 If you're looking for a casual yet stylish ensemble, reach for a grey check three piece suit and a MEMPHIS GROUP memphis milano pochette silk pocket square from Nordstrom. Both pieces are totally comfortable and will look great paired together. Perk up your ensemble with dark brown leather loafers. If you're all about relaxed dressing when it comes to your personal style, you'll love this killer combination of a black blazer and a MEMPHIS GROUP memphis milano pochette silk pocket square. To add elegance to your ensemble, complement with black leather loafers. 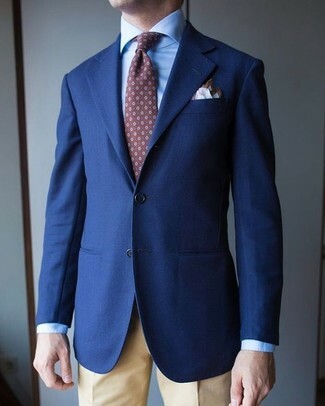 If you're a fan of relaxed dressing when it comes to fashion, you'll love this stylish pairing of a navy polka dot double breasted blazer and a brown print pocket square. Channel your inner Ryan Gosling and make brown leather oxford shoes your footwear choice to class up your look. 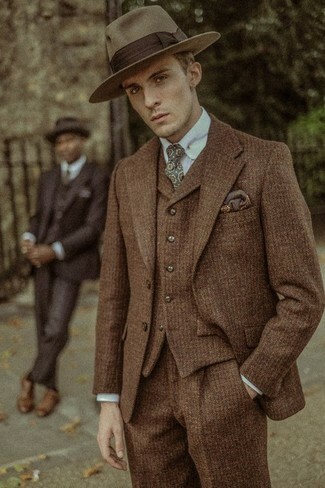 If you're on the lookout for a casual yet dapper look, dress in a dark brown wool suit and a MEMPHIS GROUP memphis milano pochette silk pocket square. Both pieces are totally comfortable and will look great paired together. 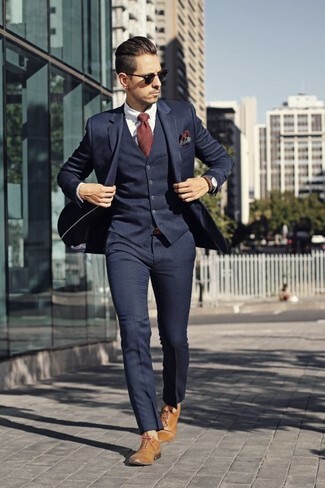 If you're scouting for a casual yet on-trend outfit, marry a navy three piece suit with a brown print pocket square. Both pieces are totally comfortable and will look great paired together. Tan leather oxford shoes will add elegance to an otherwise simple getup. 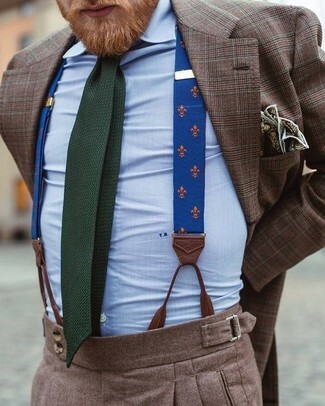 We're all getuping for comfort when it comes to dressing up, and this combination of a brown plaid blazer and a MEMPHIS GROUP Memphis Milano Pochette Silk Pocket Square is a practical example of that. 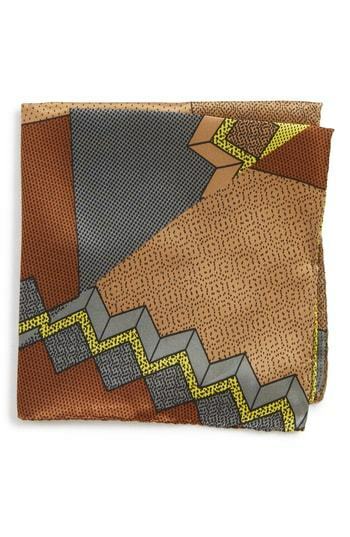 If you're looking for a casual yet seriously stylish getup, pair a brown wool three piece suit with a MEMPHIS GROUP Memphis Milano Pochette Silk Pocket Square from Nordstrom. These two garments are very comfy and look great when worn together.